This afternoon, we visited three waterfalls in Rizal. This was a spur of the moment trip which my Pinoy Mountaineer partner Gideon Lasco had been egging me on to do. We tagged along my brod, Bikoy Villanueva and another hiking buddy, Sai Sicad. Their proximity to Metro Manila make them perfect for a day trip. In fact, we did it in one afternoon. We were going to visit Daranak Falls in Tanay, Rizal. But on the way, we saw the sign to Hinulugang Taktak in Antipolo City and decided to stop over. Since it had just rained (or was still raining in some parts) the flow of the water was quite strong. It was a great sight. Hinulugang Taktak was a favorite excursion place for pilgrims who visited the Nuestra Senora de Paz y Buen Viaje in Antipolo during the olden days, thus the folk song "Tayo na sa Antipolo." Sadly, there was a lot of garbage and the falls itself distinctly smelled like detergent. I could just imagine how many women were washing clothes upstream because indeed, it was detergent since soap suds were forming at the bottom of the falls flowing to the stream. From Antipolo, it was a quick drive down to Tanay. 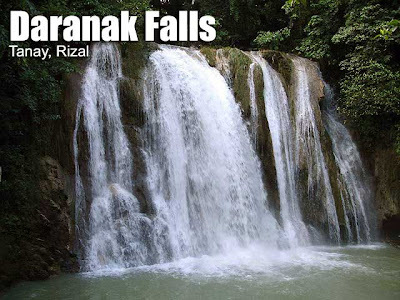 Daranak Falls was the first waterfall I remember visiting. It was a grade 6 camping trip. There are actually two falls, the main one and a smaller, but equally forceful one beside it, which both emptied into a single pool. I didn't know that just a few meters away from Daranak was another waterfall, the Batlag Falls. It was fantastic! It was a five-minute hike up to get there. There were two major falls actually which cascaded down into their own their own catch basins. The smaller one on the left looked like a bridal veil. While the larger one on the right was wider. The water from both pools cascaded further down over rocks and roots of trees, flowing into the stream which flowed to Daranak. I think this was the best of the three falls. It was a good thing we visited on a weekday since we had all the falls all to ourselves. More photos in Multiply. 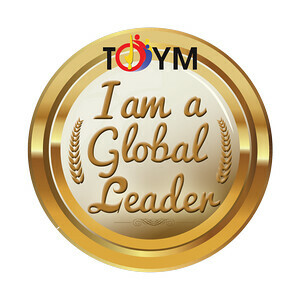 It seems well worth the visit especially since it is not too far from Manila. 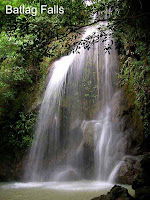 Yes, there are a lot of falls near Manila and we rarely notice them. WowW! bunch of thanks to your site, Ivan! Been surfing the net for infos 'bout this Batlag Falls. No problem. Thanks for dropping by. Have fun in Batlag! HINULUGANG TAKTAK is now dirty! I know that before it's so beautiful! they made the place ugly! 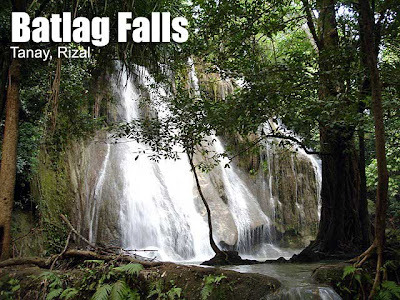 do you know where to stay in batlag falls or daranak falls if you want a get-away? i mean, trekking activity, cottages, if you have an idea, please email me at manicqueeen@yahoo.com. it would mean a big help for me :) thanks! I went to Hinulugang Tatak with my husband after the Sunday mass in Antipolo (last Sunday of May w/c I think is their fiesta). I just want to know how true is the famous song “Tayo na sa Antipolo”. But sadly, after the exciting plan of supposedly perfect lunch date near the falls with my husband, it turn out to be like a messy, irritating, quick lunch in the noisy, dirty, smelly place. I hope the locals clean the area near the falls and check what is causing the water so smelly. – sayang ang place, ang ganda sana! The hikes to the falls are very short. There are convenient parking areas as well. Hinulugang Tatak before is really nice but i can`t give bad comments because it`s been a long time I`ved seen it. I only wanted to suggest, it`s only a matter of awareness so that citizens of Antipolo will attract the attentions of the tourists and balikbayans. Pag-usapan pagkatapos pagkaisahan. i love the falls. still remember when i was in grade 5& 6 1984. we use to go camping the fall around Cogeo, rizal. but now para na syang cape ang color ng tubig. 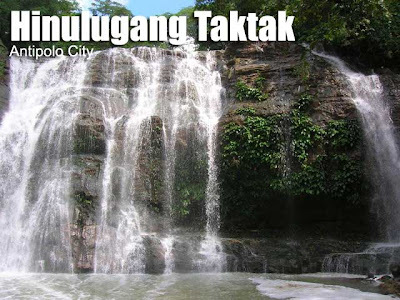 these falls are lovely been there too i have post in my blog too but i havent been to hinilugang taktak is it still worth visiting? I've been to this 3 falls in the early 1980's. Live in Cardona and schooling at Morong.Yes Hinulugang Tak2 is been overlook.Daranak and Batlag Falls are gorgeous.Im sure Dante Verona had a movie stunt at Daranak Falls. 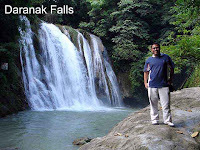 hi.. would a trek from tanay market to daranak falls manageable? o can i ride jeep to make the distance shorter?